Several different species of buffalo live throughout the world. 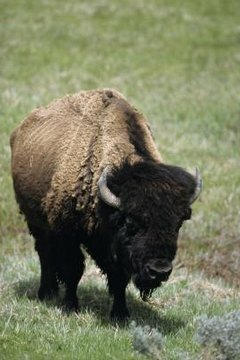 One of the most famous, the American bison, isn't actually a buffalo; it's a distant cousin to buffalo in Africa and Asia. True buffalo appear on three continents, While bison are native to two continents. The African buffalo, also called the Cape buffalo, is a powerful and dangerous animal, capable of unpredictable behavior if hunted or cornered. Two subspecies of this buffalo exist, the forest buffalo and the much larger savannah buffalo. Both males and females have horns, weigh about 1,500 pounds and stand almost 5.5 feet at the shoulder. African domestic buffalo include the Egyptian buffalo, descended from water buffalo, which is kept for milk and as a draft animal. Asia has its share of buffalo both domesticated and wild. Water buffalo or Asian buffalo weigh 1,500 to 2,650 pounds and are 5 feet to 6.2 feet tall at the shoulder. These buffalo exist throughout Asia and the Far East. The water buffalo has been domesticated for 5,000 years; the wild species is endangered. The water buffalo is the ancestor to many domesticated buffalo variants, including the Anatolian buffalo of Turkey, the Kundi and Nili-Ravi buffaloes of Pakistan, the Malaysian buffalo of Malaysia and the Murrah and Pandharpuri buffalo in India. One type of buffalo exists in Australia; it was introduced from the eastern Indonesian islands in the 1800s. Due to an eradication program, fewer than 250 feral buffalo exist in Australia. Feral buffaloes are those buffaloes that were domesticated as farm animals at one time but escaped or intentionally let loose and established colonies. Currently Australian buffalo is farmed for milk and meat. Although technically not buffalo, American bison and European wisent are commonly called buffalo. The bison and the wisent share a common ancestor and are similar in appearance; both reach about 6 feet at the shoulder, and both can weight a ton. The American bison (Bison bison) population had dwindled to less than 1,000 before efforts to preserve the bison began in 1894 with the first laws making it illegal to hunt bison in Yellowstone National Park. Wisent (Bison bonasus) was extinct in the wild by 1919; only a few wisents alive in zoos. As of 2006, about 1,800 wisents in wild herds exist due to reintroduction in Russia, Poland, Lithuania, Ukraine, Belarus and Slovakia.